Water use declined in the Great Miami River Watershed by 50 percent between 2005 and 2013, which mirrors a national trend. * With the dire predictions for water shortages in other parts of the world, this may seem like good news for our region, but there are consequences. 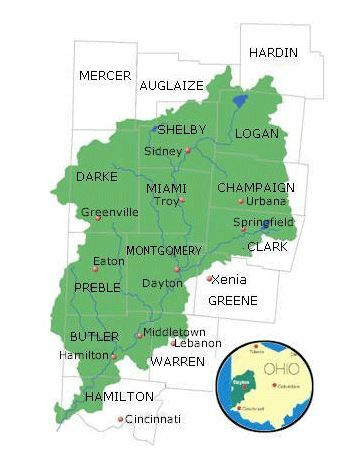 Great Miami River Watershed: All of the land in green drains to the Great Miami River. The good news is that we are wasting less water and using it more efficiently in industrial, commercial and agriculture processes. Having plenty of water means this region is better prepared for future unpredictable weather patterns. Declines in water use, however, also happen when industries or businesses close or move out of the region. Decreased water use could mean there is less demand for water. Less demand means fewer water customers. Most water utilities have rate structures that charge customers based upon the amount of water used. As customers use more water, revenues increase. But fewer customers don’t translate into fewer expenses because the same amount of infrastructure is required to deliver the water to users. Some water industry experts refer to this trend as the ‘conservation conundrum’ where declining water demand creates significant financial challenges for water utilities that are faced with rising costs to maintain and repair aging infrastructure. These costs must be recovered from a shrinking customer base. In 2005, total water use in the region was 580 million gallons of water per day. By 2013, water use declined to just over 290 million gallons per day. Water uses in Ohio are grouped into seven categories: public drinking water, golf course irrigation, power generation, agricultural use, industry, mineral extraction, and miscellaneous uses. From 2005 to 2013, use of water in our region declined in most categories. According to a recent report by the United States Geological Survey (USGS), public drinking water use declined by 5 percent nationally from 2005 to 2010. In our region, it declined by 15 percent, from 2005 to 2013. Locally, power generation saw the greatest decrease in water use. Water used for power generation declined by 90 percent over the eight-year time period. Most of this reduction came from the decommissioning of Dayton Power & Light’s Hutchins Power Station. Water used for mineral extraction and for industrial production declined by 69 percent and 55 percent, respectively. The only significant increase in water use occurred in agriculture (15 percent). Water use statistics in the Great Miami River Watershed mirror a national trend of declining water use. Water use in the United States was at 355 billion gallons of water per day in 2010. This was the lowest water use in the United States has been since the 1960s. The reduction likely is due to several reasons, including industry’s efforts to conserve water to reduce expenses, a shift from coal (which uses a lot of water) to more energy-efficient fuels, and the increase of energy efficient appliances in homes. Given the statistics, our region isn’t expected to face water shortages anytime soon. This is an opportunity to attract additional responsible water users to our region. The challenge for water utility managers in this area will be to figure out how to generate sufficient revenue to maintain and improve existing infrastructure in a world that will continue to become more water efficient. This may require rethinking traditional business models and rate structures. *Even California, which is in a serious drought, has seen reduced water usage. The challenge in California is that despite conservation efforts, the state still uses more water than it receives from rain and snow.